With its fantastic Italian Garden and rare collection of art, Villa Bordonaro ai Colli is the epitome of the Palermitano country house. Barone Chiaramonte Bordonaro and his family have created an apartment for guests within the vast villa, originally built as a home for King Ferdinand III when he was forced into exile by the invasion of Napoleon. 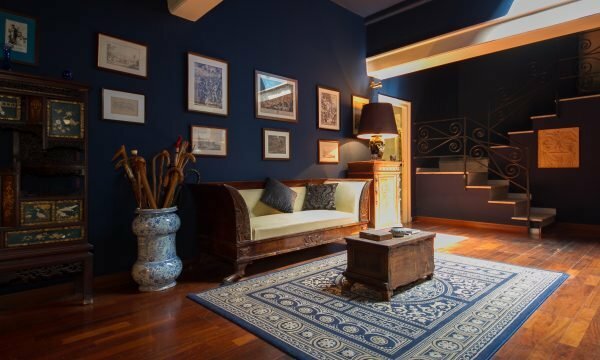 The apartment occupies the second floor of the villa, and comprises an entrance hall, a dining room with fireplace, three bedrooms (one with fireplace), two bathrooms and a kitchen. Furniture and furnishings are antique, and although the apartment does not have a terrace, its windows look out onto magnificent flower beds and a nineteenth century fountain. To compensate for the lack of terrace, the owners have set aside part of the garden by the swimming pool for the exclusive use of guests. La Foresteria is for people who are fascinated by the past, and for whom the idea of having an insight into the life of the Palermitani aristocracy is more important than ultramodern fittings – for example, old buildings are elastic and the 18th century maiolica floor tiles undulate in places; the bathrooms are simple and not ensuite; and the kitchen is a little old fashioned and basic. On request, a fourth bedroom is available for children. Visiting the state rooms of the piano nobile, where the family still live, and arranging to have a formal lunch in the grand dining room. Historic centre of Palermo is easily reachable by bus – the bus stop is in front of the gate, but if you want to go with car, is good to know. All Vehicles except registered eletric vehicles and motorcycles need to buy a permit. Non-residents must meet a petrol Euro standard 3 and diesel Euro 4 to get a permit to enter the ZTL. You have to buy a pass for to be allowed to enter the ZTL. 5€ for day.